Courtesy of Team Lehrer & Earley, Sotheby’s Int. RE/Grant II. BRAND NEW BUILD Eco Luxe Contemporary Pueblo Dream Home & Casita. One level, private gated compound in prestigious area 4 minutes north of the Plaza. 1.7 wooded acres w/mature pinons, desert arroyo; water harvesting, drip irrigation, exquisite xeriscape plantings & woodland stream. Energy efficiency meets livable luxury; Green Build HERS 43! Sophisticated design & solid state of the art construction provide innovative indoor/outdoor living. Rustic elegance at its finest, soft quiet colors & rich bold textures bring excitement to traditional New Mexican flair. Interior courtyard w/antique fountain, Wolf package, SONOS, Crestron lighting, radiant heat, central AC. Grand great room w/majestic beams, separate dining, epicurean kitchen, suave butler’s pantry w/wine storage, perfect for entertaining & large events. Two large Guest Suites w/wide-plank oak floors, fireplaces & luxurious ensuite baths share covered portal w/modern fountain. Grand Master Suite w/large kiva, private sitting room & massive walk-in closet. Sensual ensuite bath w/ soaking tub, FP & double shower, his/hers WC Kohler bidets. Elegant gym/spa, dual sauna, ¾ bath; office/den; superb laundry & mud rooms w/storage complete the compound. 5 garage spaces, ample parking. 7 fireplaces. 4 portals. Enclosed lush back lawn. Stargaze on the observation deck. Casita flex space: guest quarters/studio/ workshop/media area. PV Solar. Fire Sprinklers Security System. Plans/ permits/utilities in place for second 1 BD casita. 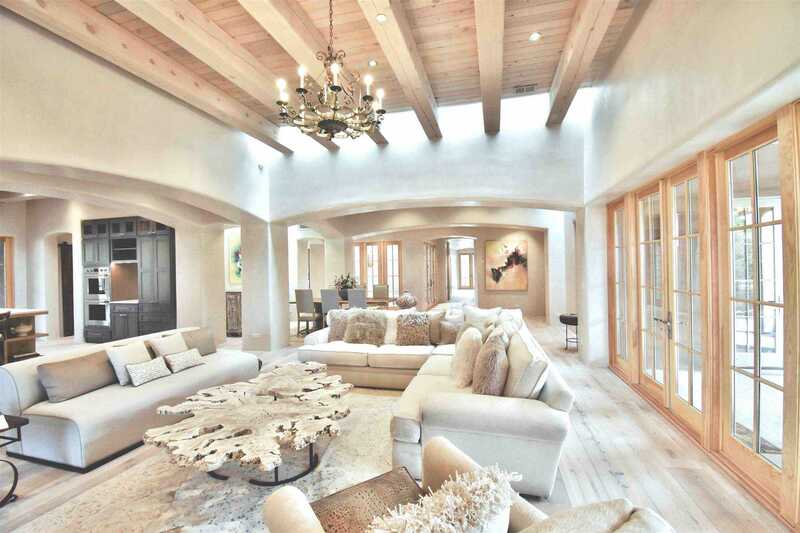 I would like to schedule a showing appointment for this property: MLS# 201804984 – $6,000,000 – Casa De Lavanda, Santa Fe, NM 87501.